i didn't take a camera, but then there was this song, and the night was falling, so when the bride began to dance by herself, i borrowed a cousin's new iPhone which i didn't know how to use, and just clicked away anyway. it's about the moments, i told myself. it's about that swirl of a white dress that might be a bride, dancing, or maybe a flower, blooming. perhaps the september moon in a sky aswirl with stars. possibly all of the above. it was the perfectest of weddings - a white horse drawn carriage, a lake catching the sunset, fireworks in the darkened night sky. a couple so in love you could feel it when you got close. and family, family, family. a cousin helping his youngest daughter down the aisle, she the shy flower girl who had to think a minute or two about tossing those petals, though not so shy when the dancing began. another cousin performing the ceremony. friends who count as family. the bride's young daughter walked her mother down the aisle, in a matching white dress and bare feet and flowers in her hair. there was laughter and there were tears, and then there was dancing. 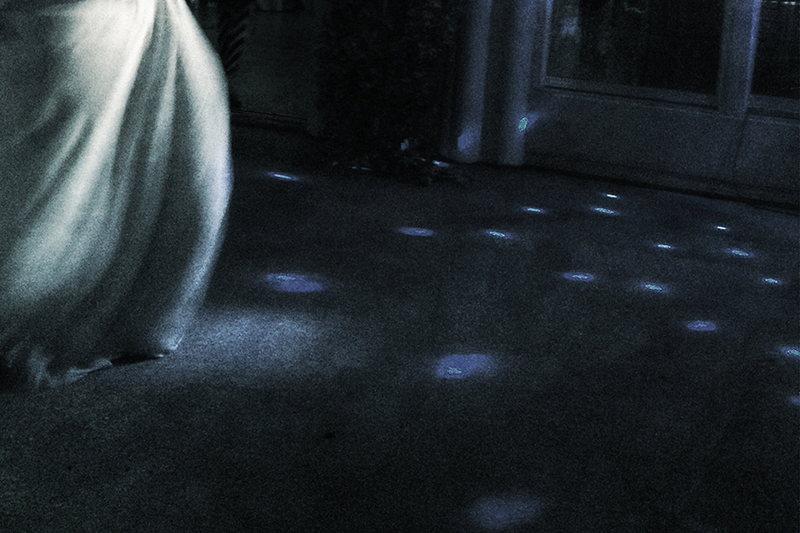 no matter your age, you were on the dance floor. no matter if you didn't know the song, you were on the dance floor. no matter if you had no partner, you were on the dance floor. and the bride? who had a partner, who'd slow danced that first dance of the rest of her life with him, didn't stop. she danced with young cousins, and cousins her age, and uncles and, as i said earlier, even by herself. hermit though i be, i danced the night away under wedding stars and fireworks, and i say to you that it is the cure for whatever ails you. and it is. i meant it. truth. it's true. dancing is always the best. and it does sound like a fairy tale wedding, so beautiful. and that picture... that picture is just the BEST. so true, dancing does something magical to the soul.